Author Winnie Czulinski invites you to test your knowledge of Celtic culture. The quiz is an except from “Drone On! 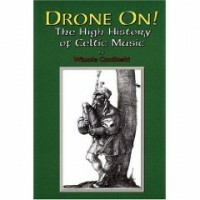 The High History of Celtic Music”, a humorous new book by Winnie Czulinski. Test your knowledge of Celtic culture and music. Grab a pen and a piece of paper and don’t cheat – the answers are at the bottom of the page! FINGERS AT THE READY… LETS GO! 1) What are the seven “Celtic nations”? 2) What was the most important fish in Celtic mythology? 3) Maewyn Succat became a famous Irish religious figure under what name? 4) What kind of specialised Celtic song-form was urine used in? 5) What is a “Strathspey”? 6) What’s the name of the Irish bellows-blown bagpipe, and what does the name mean? 7) Why is the mountain dulcimer sometimes called a stringed bagpipe? 8) What does the Gaelic word “craic” (pronounced “crack”) mean? 9) Which 18th-century blind Irish harper created many “planxties” — and just what is a planxty? 10) Which historical “lady a la moan” wrote the Scottish song “Will Ye No Come Back Again”? 11) What 19th-century American scholar collected so many Celtic folk songs he just had to number them all? 12) a) Who wrote the lyrics of the famous song “Danny Boy”? 12) b) Where was the author when he composed “Danny Boy”? 13) When he was almost Baroque, what famous classical composer churned out dozens of arrangements of Celtic folksongs for a big publisher? 14) What Irish rock group had a name that means “kiss my a—” (i.e. posterior)? 15) How many taps per second can famous Irish-American dancer Michael Flatley do? 1) Ireland, Scotland, Wales, Isle of Man, Cornwall, Brittany (NW France) and Galicia/Asturias (NW Spain). 4) The “waulking” song, sung by a group of people pounding/kneading wet wool treated with urine, to shrink and “full” the fabric. The ammonia in stale urine also helped intensify the colour of the cloth. 5) A distinctive Scottish tune and dance, named for the strath or valley of the Highlands’ Spey River. 6) The uillean bagpipes, and it means “elbow,” as they’re squeezed under the arm. 7) Traditionally played, it has a “drone” – an underlying note that remains the same. 9) Turlough O’Carolan. A “planxty” was a song composed specifically for a patron. 10) Lady Caroline Nairne (1766-1845), a staunch Stuart supporter. 13) Ludwig van Beethoven, for Scottish publisher George Thomson. And actually, Joseph Haydn and Ignaz Joseph Pleyel also did folksong “arrangements” for publishers. 15) 35 taps per second. What did you get? Less than half? Me too, best buy the book! Not only does it give a comical overview of Celtic music it begins with a unique historical and cultural introduction to the Celtic nations.